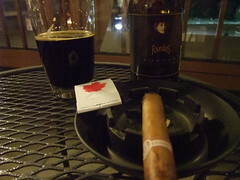 Founders Porter and a Cuban Monte Cristo; not a bad finish to a great day. Hope you all had a great Memorial Day weekend. Jeanne & I took a trip up to Whistler, BC for the long weekend to celebrate her birthday (which is tomorrow! ), and I can’t say enough about how much we enjoyed Whistler and its 70-degree weather. We didn’t go skiing (you definitely still could), but we did go whitewater rafting, took the gondola up to the top of the mountain, ate at some great restaurants and even managed to find time for massages. It was a relaxing trip that was much needed for both of us. If you’ve got a free weekend, check out Whistler.com for some seriously great hotel deals right now. Of course, we did manage to fit in a few beer related ventures. We drove up to Bellingham for the night on Friday to cut the drive in half, and we took the opportunity to stop by Chuckanut Brewery for dinner & beers. I enjoyed a pint of their newly tapped Dunkel before grabbing a pint of their sublime Rauchbier to go with an order of smoked ribs for grub; talk about a perfect pairing. Chuckanut beers are doing very well in the Seattle market, and it sounds like they’ve got someone making several trips a week to run down kegs at this point. Keep them coming! Up in Whistler, we visited the BrewHouse at Whistler, which is a Mark James Group Brewery/Restaurant. They were advertising a “new” IPA that was very good, and they had a smoked porter that was pretty light all around, but still worth trying. It was tempting to fill my growler with that IPA, but I’m seriously trying not to buy much extra beer these days (yeah, it’s tough…but I need to make a dent in what I already have). We also tried the Alexander Keith’s IPA (awful; but drinking it at the top of Whistler Mt. made it better), and we picked up several beers at the liquor store that I haven’t tried yet. One of my drinking highlights of the weekend was enjoying a Founders Porter (that I brought with me; thanks, Bri) with a Cuban Monte Cristo cigar. Perfect ending to a perfect day. On our return trip home, we finally managed to stop in Skagit River Brewing. In several past trips, we’ve always been around the brewery at like 10am before they open, so it was nice to finally make it in. 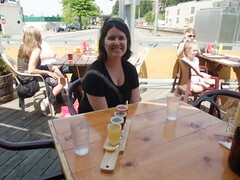 We enjoyed a sampler on their sunny patio with the always enjoyable Scullers IPA as the highlight. The next time you pass through, I highly suggest a stop here for a pint or two. Sorry you had to suffer through Alexander Keith’s “IPA”. The Mark James brewers are all good, but you have to avoid their generic pale ale and lager. They’re made to be commercially acceptable and are consistent across the Mark James franchise. Commercially acceptable is, of course, a euphemism…guess. Not counting Vancouver, you missed out on Howe Sound Brewery which is on the road between Vancouver and Whistler. Damon – thanks for the heads up on Howe Sound…I’ll definitely put that on the agenda for the next trip!